Recall and apply triangle properties. Sketch and construct triangles with given conditions. Determine whether a set of given conditions for the measures of angle and/or sides of a triangle describe a unique triangle, more than one possible triangle or do not describe a possible triangle. 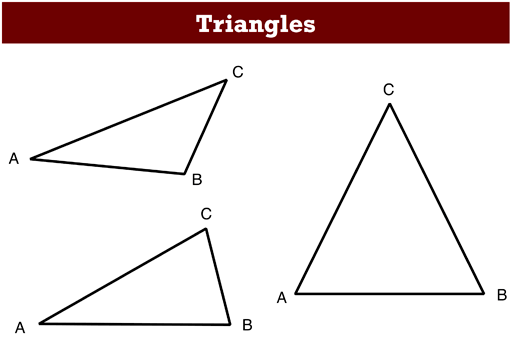 After a whole-class introduction, students work in pairs or threes on a collaborative task, determining whether sets of conditions describe possible triangles (unique or otherwise) or whether it is impossible to draw a triangle with these conditions. Throughout their work, students justify and explain their thinking and reasoning. They then compare their categorizations with their peers before reviewing their work and what they have learned in a whole-class discussion. In a follow-up lesson, students review their initial work on the assessment task and work alone on a similar task to the introductory task. Each student will need a copy of the tasks Triangles or Not? and Triangles or Not? (revisited), some plain paper to work on, a mini-whiteboard, pen, and eraser. Each small group of students will need the Card Set: Possible Triangles? (cut-up), a pencil, a marker, some poster paper, and a glue stick. Rules, protractors and compasses should be made available. 15 minutes before the lesson, a 90-minute lesson (or two 50-minute lessons), and 20 minutes in a follow-up lesson. Exact timings will depend on the needs of your students.